Many Thanks to Jim for this edition! 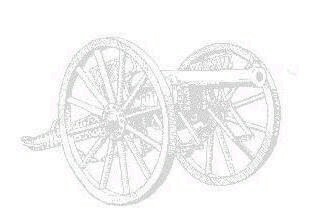 In 1885 there were major advancements in artillery. Heavier and more advanced shells with calibers over 150 mm made the old rock and stone fortifi cat ions obsolete. As a result, all new Austrian fortifi cat ions were to be built partially underground or in rock with roofs made of concrete 2 to 5 meters thick and reinforced with steel. Austrian fortifi cat ions had some interesting characteristics. They were always defensive in nature and designed to help control the surrounding territory. Most were armed with 100 mm howitzers in steel turrets, 6 or 8 cm guns, and lots of heavy machine guns. Shooting distance was short and calibers were too small to inflict and damage on the distant Italian fortresses. Each Austrian fortress was designed to be completely independent. They had large underground ammunition supplies, food, water and generators to produce electricity. Troops were specially trained for living long periods of time underground and in complete darkness. They could even load, aim and fire weapons in the dark because of a “brail” type touch system of markings on the guns, shells and detonators. Two major military schools, Festungsari Trient (an artillery school) and Pioniergenie Trient (a fortifi cat ion school) were responsible for planning the defense of the Southern Front. 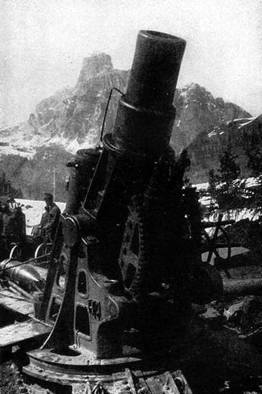 From 1900 to 1915, in Trento (which was strategically lo cat ed), a defensive system was developed consisting of over 70 forts and 60 armored positions all able to resist sustained shell fire for long periods of time. Another strategic area, Lavorone Sperrgurtel was also protected in a similar manner. On May 23rd 1915 the Italian Fort Verena fired the first shots aimed at Austrian Fort Luserna. Fort Verena ,higher in elevation and armed with 149G long range cannons was unable to direct fire with precision due to high altitude winds and poor quality weapons. Many shells fell on the small town of Lusern . The people of Lusern suffered many casualties and the towns women, children. and elderly had to be hastily evacuated. 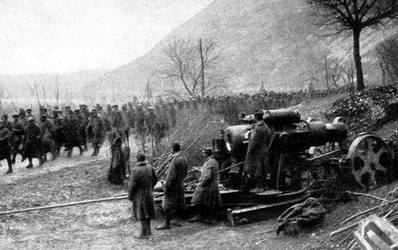 At the start of the Italian/Austrian war most Austrian units were already fighting on the Russian front. As a result, the Austrian border with Italy was protected mostly by volunteers who were not even part of a regular army unit. Soldiers ages ranged from 16 to 80. 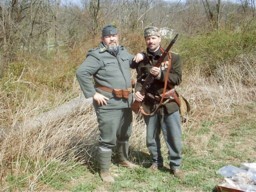 The oldest being Farmer Senn of Meran volunteer battalion. They were often armed with older rifles and equipment and logistics so terrible that many times soldiers wives would bring food to the men in the trenches. The opening battle started with 40,000 old men and boys against 230,000 regular Italian troops. Wave after wave of Italian attacks were halted by just a few Austrian defenders situated on top of the mountains. Italian troops were especially vulnerable to Austrian machine gun fire and sharp shooters. yet. A captured Italian officer was found with a document warning him about the Austrian sharp shooters of the Meraner Standschutzen battalion. After the tragic and completely avoidable losses Italian commanders decided to try to destroy the Austrian defenses with heavy artillery. In some months thousands of shells of all calibers rained down on the Austrian positions. At the Austrian Fort Lusern communi cat ions were destroyed, there was no electricity, water and food was in short supply and the troops hadn’t slept in days. Lieutenant Commander Nebesar lost his nerve and put up a white flag despite the objections of his well trained squad. When volunteers on an overlooking hill saw the white flag all the Austrian forts in the area started firing on Fort Luserna !! A young 18 year old volunteer riding on a bicycle went to the fort under heavy enemy AND friendly fire, and removed the white flag from a building rooftop. About the same time volunteer units halted the Italian attack. Austrian pioneers entered the fort and removed Nebesar and another officer from power. Nebesar was put before a tribunal but the war ended before he was condemned. The young volunteer who took down the white flag (Otto Jochler of the Meraner Standschutzen battalion) received a silver medal for his act of bravery. 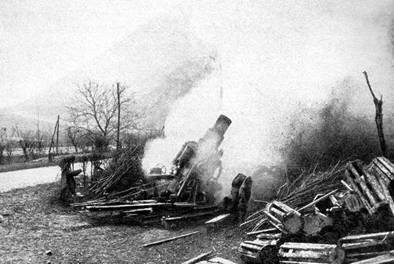 The new Italian strategy of raining massive amounts of artillery shells on Austrian positions created a grave situation. Austrian commanders concluded the solution to the problem would be using the Top Secret M11. Only one of the most sophisti cat ed and modern mobile howitzers of the Austrian army. It was a secret weapon first used to destroy Belgian forts and was little noticed or ignored by the Italian high command. The M11’s range was over 11 km and it could fire a 305 mm 384 kg shell with deadly precision. It consisted of three major components and could be assembled in only 50 minutes! Austrians were fanatical about topography and already had the Italian positions precisely lo cat ed. 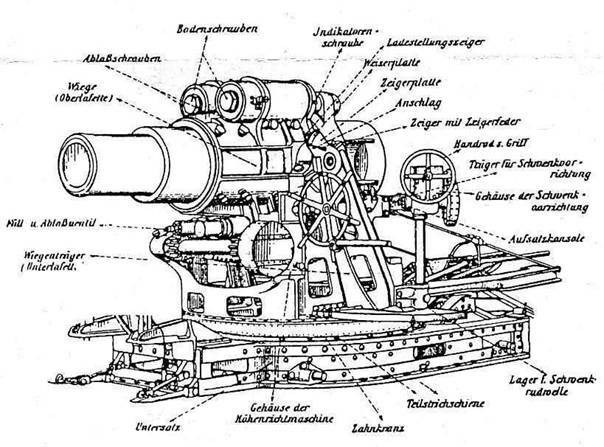 In June 1915 Austrian volunteers could hear the roar of Skoda Daimler tractors transporting the heavy guns. A triple HURRAY greeted the arrival of “Schlanke Emma” (tall Emma). There was no short supply of troops helping put the guns into position and unloading heavy shells and powder cans. 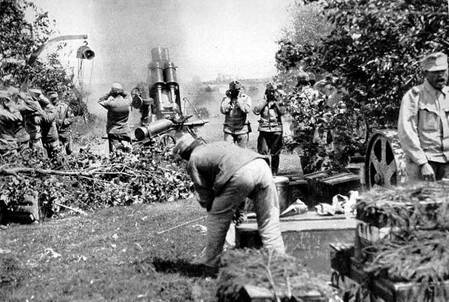 June 1915 was the beginning of the end for Italian forts and artillery positions. 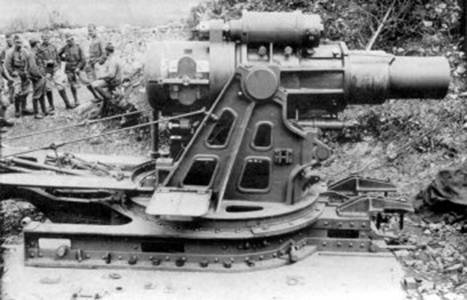 The advantage had shifted back to the Austrians………………..
Before and during WW1 this gun was one of the most sophisti cat ed and modern mortars in the world. It was used on all fronts from east to west and especially at the southern front against Italian fortifi cat ions and artillery positions. Development of this arm started in 1906. 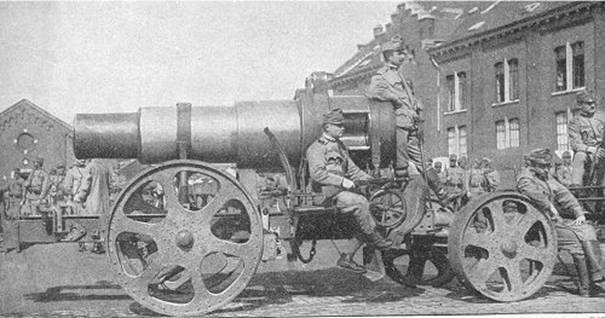 The Austro-Hungarian high command ordered a mortar, able to penetrate and destroy new concrete fortresses built in Belgium and Italy . In Italy these new designed fortresses were Fort Verena , Fort Campolongo and Fort Campomolon . These new fortifi cat ions were directly in front of the Austro-Hungarian fortifi cat ion belt of Lavarone, (a high valley plateau nearby the fortress-city of Trento ). Skoda-Werke at Pilsen a famous and well equipped arms maker was chosen to develop the new weapon. 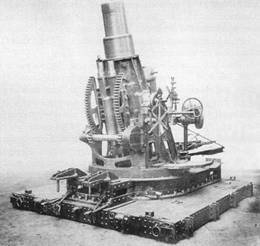 Design studies of this new mortar finished in 1908 and in 1909 the first prototype was test fired. Up to 1911 this weapon was secretly tested in Hungary . All tests showed the enormous potential of this new weapon.It was able to penetrate (with its special shell of 384 Kg weight) much more than 2 meters off solid reinforced concrete and was capable of precision fire at long ranges. 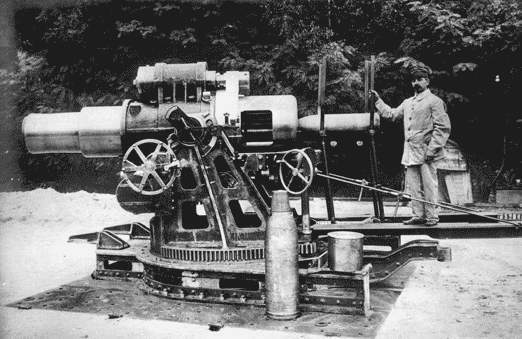 Despite a few minor mechanical problems Austro-Hungarian militaries ordered 24 weapons, officially called “30,5cm-Mortar/M11. It was the beginning of one of the most terrific weapons developed during WW1. The mortar was “State of the Art” being the most modern design currently produced. With three major components, it was transported by a special Skoda-Daimler Road Tractor. The gun could be assembled and ready to fire on only 50 minutes!!. The solid steel gun tube was attached with two hydra uli cally adjustable rods and mechanically operated recoil breaks to the carriage ,the mortar itself being mounted on a stable platform. 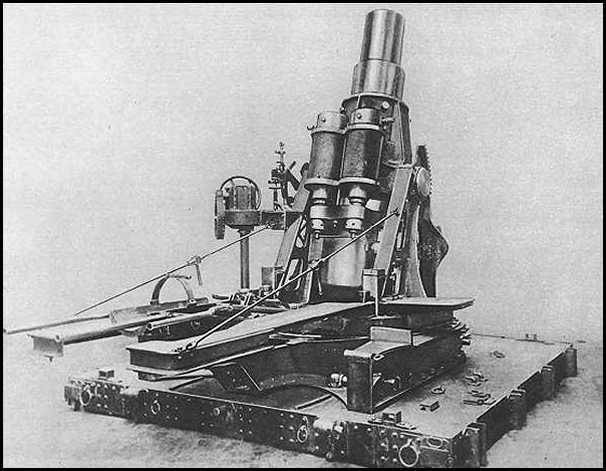 The gun had very precise adjustments for angle and elevation combined with an optical target finder. Hydra uli c semiautomatic systems would lower the gun after firing to a horizontal position making it easy to reload, Included was security system preventing accidental breech opening when the gun was loaded. All mechanic adjustments for angle and elevation were manufactured to the highest tolerances and could be adjusted by the squad during maintenance and assembly procedures. All three parts were transported by a special road-tractor weighing 15 tons, made by Skoda –Daimler,designated model 12. The tractor wasn’t capable of high speeds but could transport the parts to high mountain positions on or off the road. From 1912 to 1914 one of these mortars was used to test the resistance of new Austrian fortifi cat ion belts in Alpine mountain areas. Tests on the new armoured concrete roofs were made by hitting them directly with a shell from the M11 mortar. This testing enabled the Austro-Hungarian militaries to develop much improved fortifi cat ion technologies. The first use of the Mortar was made at the beginning of the war in Belgium on the Western front. 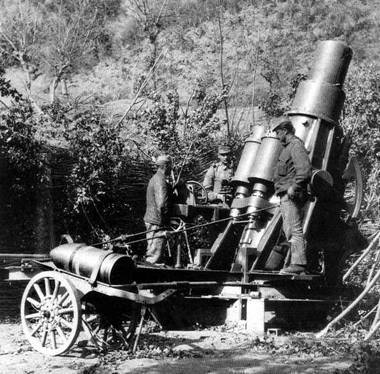 Together with heavy German artillery (Krupp 38 cm howitzers) they were used to destroy Belgian fortresses at Liege . German militaries were very impressed with the mobile M11 mortar. In one day with his very precise fire destroyed most of Belgian fortifi cat ion system!!. Karl Skoda was invited to visit the area and see the results using the new type M11 shell..
M11 on concrete platform,a precise prepared Position! The mortar was equipped with two types of shells,the “light “one equipped with a normal ground contact detonator and used against infantry positions ,trenches and lightly fortified bunkers and the “heavy” shell with a grossweight of 384 Kg equipped with a timed delay detonator. The heavy shell would penetrate exterior walls and roofs then explode in the inner part of a defence system with horrific results. Most soldiers of an enemy fort were killed instantly because of a high pressure wave created by detonation in the small kasemattes and galleries,the explosion of the ekrasit load rendered a fortifi cat ion useless and most times survivers were forced to leave immediately because of gas and smoke which filled all positions. At this time, there was no protection against an central from one of these heavy shells. Explosion of the “light “ shell would leave a crater of 8 m of diameter, and 8 m deep. Shrapnel was able to destroy walls made of bricks within 100 m , and all exposed soldiers would be killed within 400 meters It was a horrific weapon! In 1915 the Austro-Hungarian army ordered more mortars and by the end of the war they had had more than 20 Batteries each with 2 Motars 30,5cm/M11. In 1916 an improved version was developed with more firing range, the 30,5cm/M16. Same mortar!After firing it’s shell, the mortar rotates back automatically in horizontal position to make reloading easy , Italian prisoners of war passing by,a little break for the gunners! In the high Alp mountains , this mortar is on more than 2000m!! Heavy weight shell firing with maximum powder load. The pressure wave of this shot is tremendous!